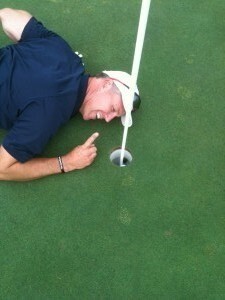 Hole In One International would like to congratulate David Pender of The Woodlands, Texas on his hole in one during the Permian Basin Gusher Golf Tournament, which took place on May 20, 2012, at Green Tree Country Club in Midland, Texas! Pender was fortunate enough to have aced a hole on the golf course that day, which measured approximately 187 yards. Even more fortunate, Pender ended up being awarded a $500 VISA Gift Card from Hole In One International for his amazing feat! That’s because when you purchase hole in one insurance coverage through Hole In One International, we’ll supply auxiliary prizes on every par 3 over 165 yards on the course which players can win should they make a hole-in-one on one of those holes! Although no one won any of the vehicles insured by All American Chrysler-Jeep-Dodge of Odessa that day, there were several opportunities to win an auxiliary prize that day, seeing as how participants played three separate 18-hole courses — Pender just happened to be the one to overcome the odds! Congratulations again and we hope you enjoy your complimentary $500! Interested in receiving a free, no-obligation quote with Hole In One International? Give us a call at 800-827-2249 or email us if you have any questions. You can also obtain a quote on our website if you’d prefer. And remember: we can also help you insure a million dollar shootout and/or putting contest as well!